Lord Blyton School Breakfast Club takes place every school day from 8.00am. There is no charge for sessions, but booking is essential to ensure that your child has a place on the day that you require. The club is run by qualified staff and volunteers. 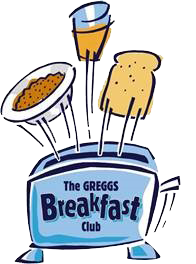 A healthy breakfast will be provided for children who attend with the last breakfast being served at 8.20am. After breakfast there will be supervised activities and fun games for the children to play to help kick start their day. Breakfast will consist of a healthy cereal or toast with a drink of water, juice or milk. We have special themed breakfasts throughout the year. Please Note: Children cannot be brought to breakfast club without having been registered, and the appropriate forms completed. Please contact the office in person or on 0191 4240550 / info@lordblyton.s-tyneside.sch.uk to register.